Leanne is a 21-year-old who has suffered with mental ill health, phobias and Obsessive Compulsive Disorder (OCD). Her time with the Building Better Opportunities programme has seen her become less anxious, increase her self-esteem and give her ideas for future employment. Leanne was initially referred to the Building Better Opportunities Programme because she wanted to improve her chances of finding employment or becoming self-employed. For years Leanne has suffered with mental ill health, associated phobias and OCD. At times, especially when she is stressed, this can be very demanding and exhausting to her health and well-being. Leanne enrolled onto the Countryside Project to Health and Wellbeing, after having time out of paid work after her previous job as a lifeguard. The course was based at Upper Moreton Rural Activities and owner Carol Carney said: “Leanne’s engagement with the course was initially working with animals as she appeared to be very anxious at first among people. Carol said: “It was so true to life. Since Leanne’s initial sketching she has now progressed to supporting some of the BBO participants with art sessions. 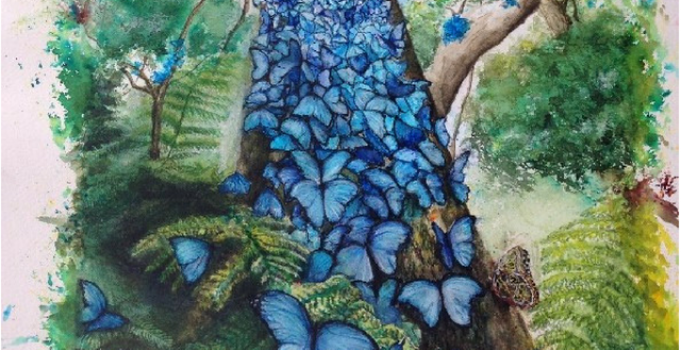 Her growing confidence in her artwork led to Leanne creating a watercolour (pictured above) which she has had professionally printed and is using as an initial marketing exercise for a business. Leanne is currently volunteering with Upper Moreton Rural Activities and hopes to get a job there as an art and craft instructor. Building Better Opportunities helps people living in deprived areas of Staffordshire who are struggling to find a job. The scheme helps people facing barriers to employment because they lack qualifications, live in an isolated rural area, have caring or childcare responsibilities, have problems with ill health or disability, or face other problems such as discrimination due to their race or age group. Two organisations – Business Enterprise Support and Steps to Work – are delivering the ’Multiple Barriers’ project in Staffordshire, part of the Building Better Opportunities programme funded by the Big Lottery Fund and the European Social Fund. It is responsible for giving out 40% of the money raised by National Lottery players for good causes. Every year it invests over £650 million and awards around 12,000 grants across the UK for health, education, environment and charitable purposes. The project received funding from the European Social Fund as part of the 2014-2020 European Structural and Investment Funds Growth Programme in England. The Department for Work and Pensions is the Managing Authority for the England European Social Fund programme. Established by the European Union, the European Social Fund helps local areas stimulate their economic development by investing in projects which will support skills development, employment and job creation, social inclusion and local community regenerations. For more information visit https://www.gov.uk/european-growth-funding.